Yeah, Of course, you’re thinking that–But even if a baby attack parrot looks cute trying to beat you at Forza 7, he’s strugglin’ cause his little beak just can’t handle that full-size racing sim wheel and shifter. Plus, you know you’d like something you could just slap on your controller. Brent Scott to the rescue. 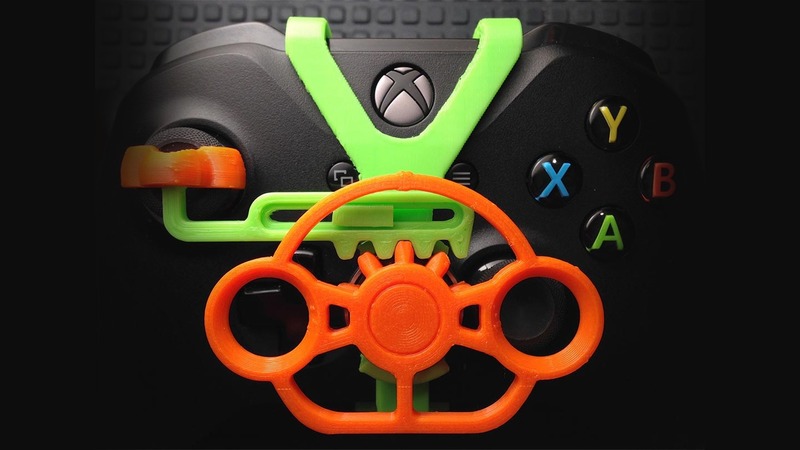 Brent, aka pixel2 on Thingiverse, has created a Xbox controller-size mini-wheel that allows you to win 2nd place with your two little thumbs (or beak). ‘2nd place is the first loser, Josh!’ Fine, I’ll take my box of participation trophies and race elsewhere. The steering wheel is a rack and pinion design that clips to both modern and older/elite Xbox controllers and allows 100 degrees of course-drifting rotation. And, the function is so smooth. Check out this driving demo! Brent used a Creality CR-10 to print the parts using Zyltech PLA. The print is crazy simple – four pieces total printed at a .2mm layer height using WALLS instead of infill for a stronger print. The only supports needed is for the frame piece. That’s it. Altogether it takes about 2 1/2 hours to print. He also has an option for a wider wheel option and low-profile pivot and rack (if printing a larger custom wheel is preferred). Oh, and you’ll need an 8x22x7 ball bearing as well. Have a model you think everyone needs? Share the link and details with us here!